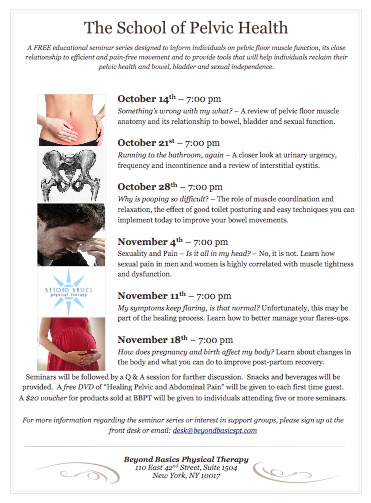 Get excited for the incredible new FREE seminar series at Beyond Basics Physical Therapy, The School of Pelvic Health! This educational series, taught by our very own STEPHANIE STAMAS, is designed to inform individuals on pelvic floor muscle function, the connection between the pelvic floor and pain free movement, and to provide tools that will help participants improve bowel, bladder, and sexual function. In addition, the seminars create a safe environment for patients to interact and build community with one another. All seminars will be followed by a Q and A session for further discussion with Stephanie. Also, classes will contain a practical component, during which Stephanie will teach a technique (ex. stretches, mindfulness and relaxation, diaphragmatic breathing) which will give participants a useful take home tool to improve their quality of life. Speaking of take home tools, a free “Healing Pelvic and Abdominal Pain,” Amy Stein’s new self-care DVD, will be distributed to each first time guest. In addition, a $20 voucher for products sold at Beyond Basics Physical Therapy, including Amy’s book Heal Pelvic Pain, meditation CDs, and massage stick will be given to individuals who attend five or more seminars. Plus, snacks and beverages will be provided. Knowledge, free DVDs and tools, and food…it’s the best of all worlds! Stephanie will be teaching the first class on October 14 at 7:00 PM, entitled Something’s Wrong With my What? It will be a review of pelvic floor muscle anatomy and its relationship to bowel, bladder, and sexual function. Mark your calendars and be sure to join the launch of this fantastic new program! The inaugural event is sure to be a hit, and we look forward to seeing you there!